A treasury of true stories, about the extraordinary people, knights and knaves, rebels and heroes, queens and commoners, who made Britain great. From ancient times to the present day, the story of England has been laced with drama, intrigue, courage and passion – a rich and vibrant narrative of heroes and villains, kings and rebels, artists and highwaymen, bishops and scientists. 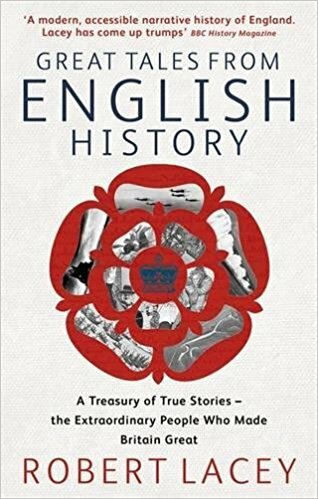 Now, in Great Tales of English History, Robert Lacey captures one hundred of the most pivotal moments: the stories and extraordinary characters who helped shape a nation. This first volume begins in 7150 BC with the life and death of Cheddar Man and ends in 1381 with Wat Tyler and the Peasants’ Revolt. We meet the Greek navigator Pytheus, whose description of the Celts as prettanike (the ‘painted people’) yielded the Latin word Britannici. We witness the Roman victory celebrations of AD 43, where a squadron of elephants was paraded through Colchester. And we visit the New Forest, in 1100, and the mysterious shooting of King William Rufus. Packed with insight, humour and fascinating detail, Robert Lacey brings the stories that made England brilliantly to life. From Ethelred the Unready to Richard the Lionheart, the Venerable Bede to the Black Prince, this is, quite simply, history as history should be told.